"Shrove" must be Old English for "pancake" because half the churches around here are hosting pancake suppers tonight. Shmoo has his own pancake supper here, made up of four oat pancakes (the best for serving cold!) with a tiny container of maple syrup for dipping, some Smart Bacon, home-fried new potatoes, and an orange. Verdict: What's not to like? Unfortunately, shmoo left the lid off the syrup container when he finished his lunch and tossed it in his backpack. A delicious, if somewhat sticky, 5 stars. P.S. 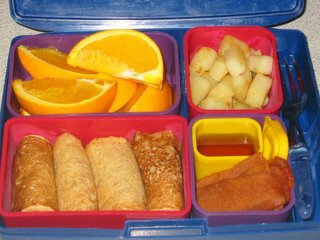 Tomorrow is Ash Wednesday, and shmoo's class will be sharing a simple meal of rice to welcome in the Lenten "fasting" season. So no lunch box, and I'll be fretting all day over his emptyish tummy. But I'll be making him a big breakfast and afterschool snack! Today I decided to try the Asian Pasta Salad recipe from the Laptop Lunch User's Guide that came with shmoo's lunch box. 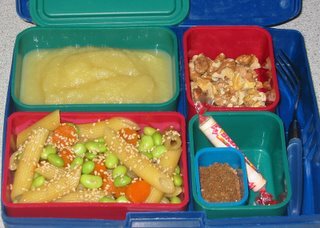 I halved the amount of pasta and dressing and loaded it up with veggies -- edamame and carrots. The large lidded container holds a generous serving of organic unsweetened applesauce. Alongside are two omega-3-rich toppings for shmoo to stir into the applesauce at lunchtime: lightly toasted walnuts and a small container of finely ground flaxseed mixed with natural brown sugar and cinnamon. I'm hoping the sugar and cinnamon will hide the flaxseed a bit and compel him to sprinkle it on. A roll of Smarties are for dessert -- last of his Valentine's candy. Verdict: Good! Tasty, easy, kid-friendly pasta salad without the usual vinaigrette-taste that shmoo doesn't like, and the flax-brown sugar mixture worked like a dream! He ate every bit of it with all the walnuts and applesauce. That's a new sneaky momma trick I'll be using from now on. 4 stars. Here's a different twist on pb&j: I made oat & barley flour peanut butter muffins topped with chopped peanuts, then used a piping bag with a large star tip to pipe some of my mom's homemade blackberry jam (mmm, thanks, mom!) into the center. 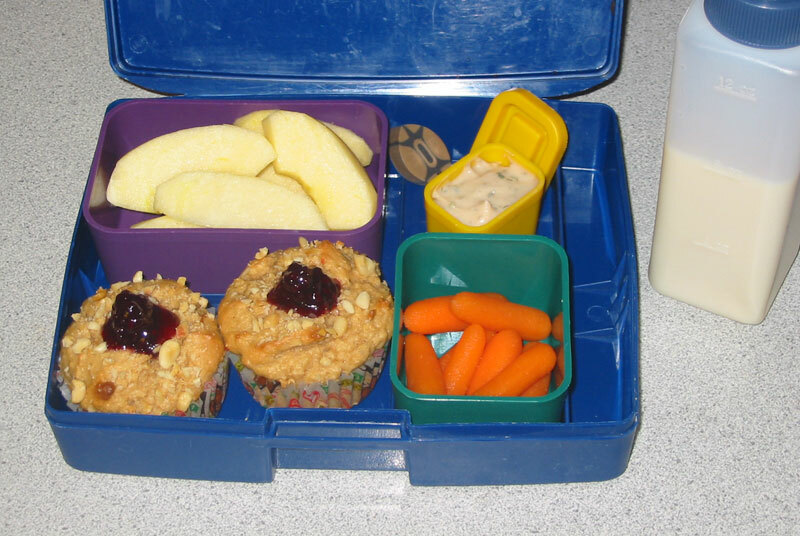 I packed two muffins, an organic apple, baby carrots, and some new ranch-flavored bean dip I've been working on. Beverage: vanilla soy milk. You can't really tell from the picture but the muffin liners have footballs all over them, so I snuck in a little football-shaped pencil topper for a surprise. Verdict: I was wondering if two muffins would be too much, but all but two bites were gone. And my whole family is raving about the new bean dip -- yay, a healthy alternative to vegan sour cream and another recipe for the book! 4 stars. Falafel are a Middle Eastern food; they are fried balls of spiced, ground chickpeas, often served in pita bread. 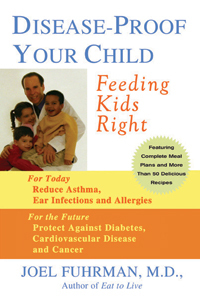 I found this very kid-friendly version in Flax: The Super Food (dah ta dah!). They are baked, not fried, aren't too spicy, and are another clever way to get some ground flaxseed into my son (who suddenly hates all hot cereal with a passion, so there's no more stirring it into his oatmeal each morning...). 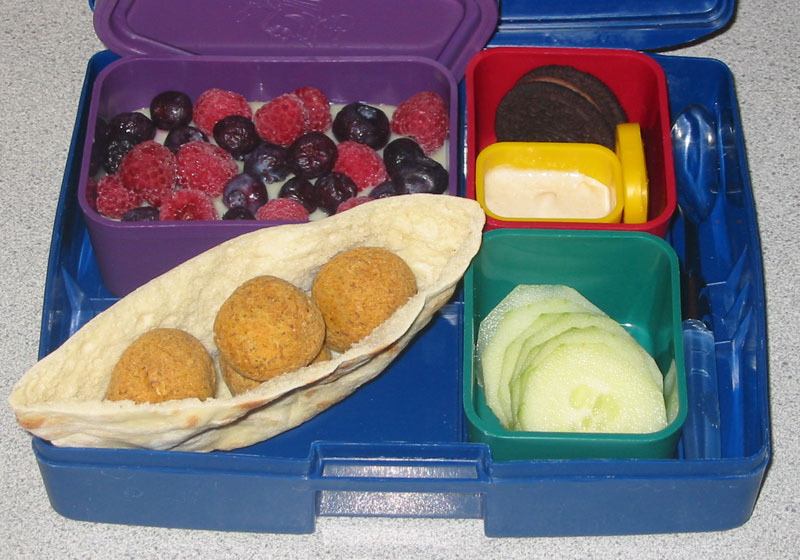 So it's five flaxy falafel balls on pita bread with a small container of tahini lemon sauce and cucumbers on the side; a lime soy yogurt (shmoo's favorite) topped with frozen raspberries and blueberries; and one chocolate creme Oreo for dessert. 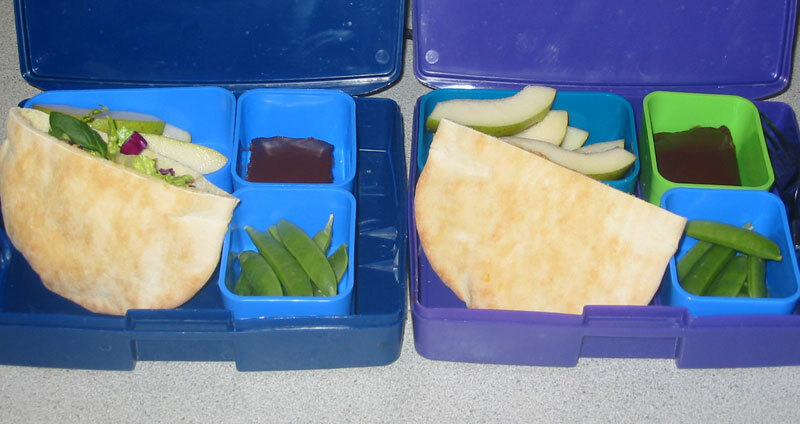 Verdict: I had to moosh the pita a bit to close the lunch box, but it fit! Shmoo helped make the tahini sauce this morning just to his liking (toasted tahini, a pinch of salt, a small squeeze of fresh lemon, and water) and dipped his cucumbers in it. Just two cucumber slices and one mysteriously wayward falafel were left. 4 stars. 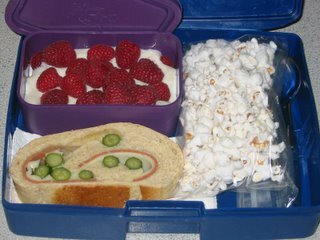 Here's a lunch menu inspired by my brilliant friend Linda, who packs wonderful lunches like these for her lucky daughter. 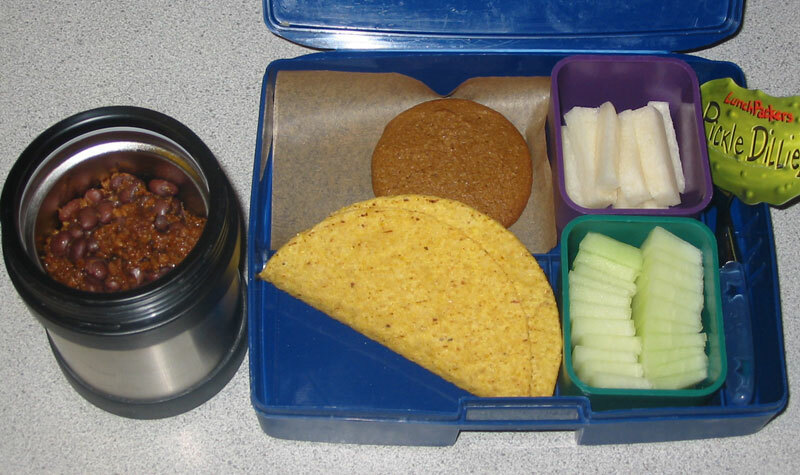 It's "Build A Taco" -- Taco Smart Ground and black beans stay warm in the thermos; at lunchtime you spoon the taco filling into the corn taco shells. Linda's daughter even sprinkles hers with shredded lettuce, but shmoo won't go there. The veggie and fruit of the day are jicama and honeydew, which are really fun to say together. For dessert, one fresh-baked gingerbread cookie for a little dose of iron-rich blackstrap molasses. Verdict: First I was worried that the hard taco shells wouldn't fit in the lunch box, but they fit perfectly and didn't break! Then I was worried that Little shmoo would be unable to manage filling the taco shells without making a mess, but my goodness, he must have maneuvered that taco filling with the dexterity of a brain surgeon. 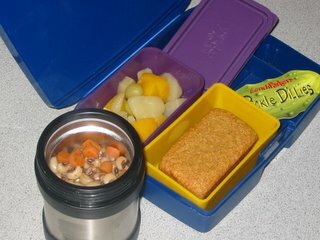 Every bit was scooped out of the thermos and not a trace was left in the lunch box. Only a few slices of honeydew remained. 5 stars. Thanks, Linda! I decided to try another recipe from the new Vegan Family Favorites cookbook today. I used mini-tart pans to make individual Quiche Lorraines filled with crumbled Smart Bacon and broccoli in a savory tofu custard. 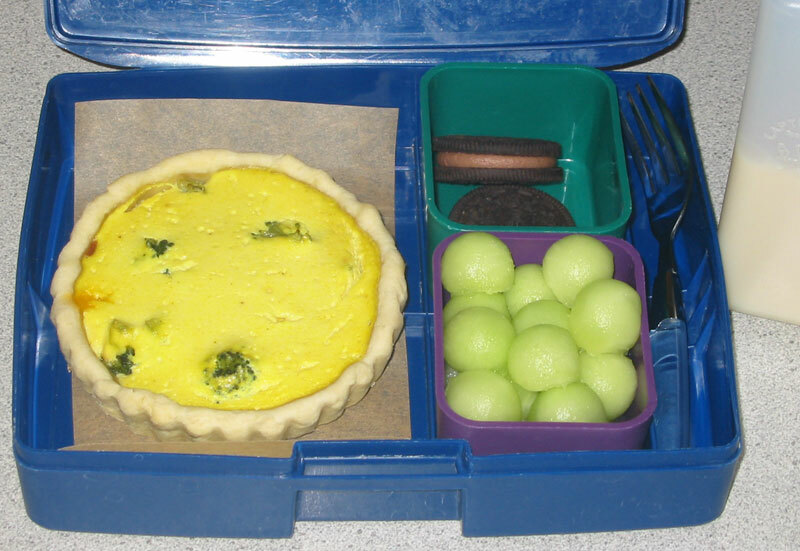 I packed one mini-quiche along with some honeydew melon balls and two chocolate creme Oreos for dessert. Beverage: vanilla soymilk with a shot of the hoity-toity all natural French hazelnut syrup my husband bought me for Valentine's Day (isn't he sweet? -- we love soymilk with hazelnut, the flavors are so right together). Verdict: I added a bit more silken tofu than the recipe called for so the texture was quichey but solid enough to travel well. If I were to make it again I think I would add some nutritional yeast flakes for a "cheesier" taste. Shmoo said it was "good!" but still left the edges behind -- even flaky pastry crust gets the cold shoulder! 4 stars. I bet you were wondering when I was going to get around to tempeh, weren't you? Well, here it is! I used the Tempeh Bacon recipe from Vegan With a Vengeance . Of course, it would make a fantastic "BLT" on wholegrain bread with Vegenaise, lettuce, and tomato, but shmoo wanted just the tempeh. I also made my own vegan fruit jell using Bryanna's recipe posted in the comments last Friday. It worked like a dream! I used cran-raspberry 100% juice and floated frozen organic raspberries in the jel. In the veggies department today we have steamed diced kohlrabi and peas. Verdict: I always know I have a winner when shmoo begs to eat his lunch for breakfast! The tempeh was a big hit; we all loved the smoky flavor. Shmoo also liked the veggies, but thought the jell was tart. I agree, but we all liked it once we had gotten over our super-sweet jello expectations. Next time I'll probably add some sweetener or use a sweeter fruit. 4 stars. I was so happy to discover frozen black-eyed peas at a local grocery store. They cook up much faster than dried: I put a bag of frozen black-eyes into 4 cups boiling water and simmered for 10 minutes, then added chopped carrots, garlic, herbs & spices and cooked for another 10 minutes or so until the carrots were barely tender. I packed them in a hot thermos alongside a fresh baked mini-loaf of wholegrain cornbread. 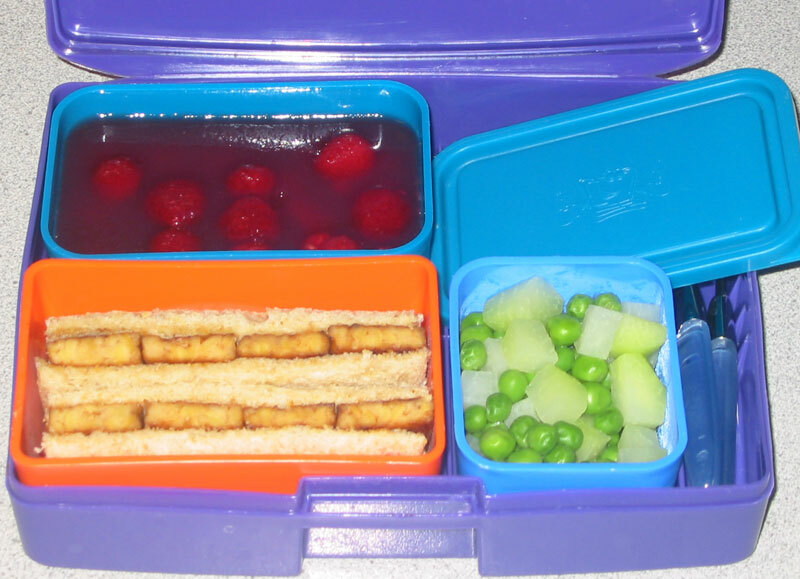 For fruit and a treat, some "lite" mixed fruit canned in fruit juice. Verdict: Hey, it turns out cornbread doesn't have "crust"! He ate the entire mini-loaf and all but a couple bites of the peas. The only thing he rejected was the canned grapes in the fruit mix. Last time he loved the grapes and refused to touch the peaches, so you just never know! 4 stars. Today was another noon release day. Little shmoo & I went out for avocado and veggie sushi at Subs 'N' Jean (great name for a sushi bar, isn't it?). Then we walked across the street to Ariel Gourmet and bought some Swedish Ginger Thins for dessert. Yum! Hey, my friend Bohemian Mama sent me a link to these great Lunch Labels at the Martha Stewart Living website. You can print out stickers and labels to decorate lunch bags or seal them closed (although I personally would recommend using an insulated lunch case instead of paper). Even better, print out the magnetic lunch chart and a list of your favorite lunch items and plan out menus for the week. If I were using the chart I would probably change the clipart, taking out the pretzel or cupcake and adding a vegetable. Enjoy! My goodness, I must have at least a dozen recipes for eggless tofu salad -- it's in almost every vegan cookbook I own. All the recipes were similar, so I settled on Deborah Madison's version in This Can't Be Tofu! , mostly because it includes capers, which shmoo loves, and the fresh herbs and touch of paprika sounded good. 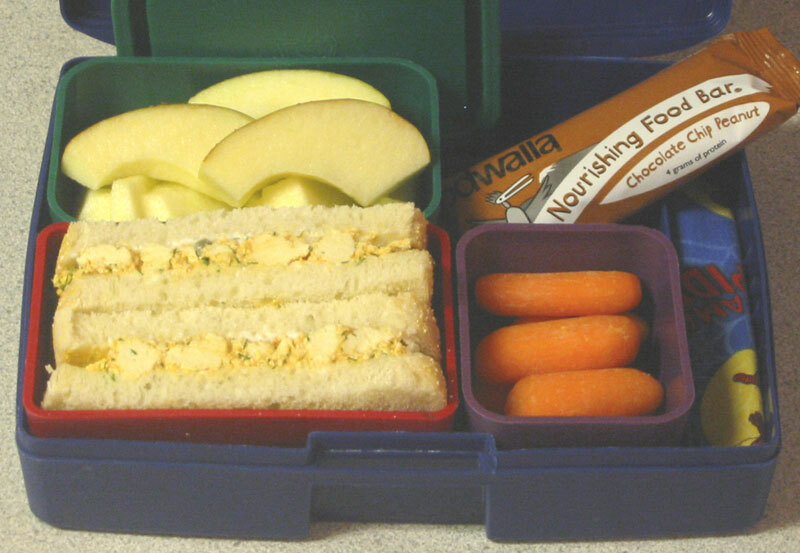 I spread the eggless salad on white bread with a thin layer of Vegenaise, and packed it with organic apple slices, baby carrots, and an Odwalla Chocolate Chip Peanut Nourishing Food Bar. Verdict: I like giving shmoo these Odwalla bars; they're not too sweet and they're even enriched with calcium. It's nice to see more nondairy sources of calcium springing up all the time. I don't think the sandwich will be a returning favorite, though; he finished less than half. 3 stars. Tomorrow we're having a "Baked Potato Bar" at our monthly vegetarian potluck. I decided to make a big batch of vegan chili con "carne" for a nice tater topping and a good lunch, too. I packed it with crackers, an organic pear, and some Dole Orange Gel with Mandarin Oranges. Oh, I was sooo excited to find these little gel cups made with carrageenan instead of animal gelatin -- Shmoo can have a jello cup for lunch just like his peers! Then I was immediately crushed and infuriated by the inclusion of cochineal in almost every flavor. Why why why did they go through all the trouble of making a gelatin-free dessert cup and then put in smashed insects?? Orange was the only flavor available at our local store with no bug guts. Verdict: He ate every bite of chili but didn't touch the crackers (I can't imagine chili without crackers, but I guess that's just me). He liked the gel but said it "tasted artificial". Well, yes it is! I wonder if anyone makes all-natural gel cups? 3 stars. Today I decided to try a few recipes from Dreena Burton's cookbook Vive le Vegan! I filled pita pockets with her Cannellini Bean Yam Hummus. Shmoo's is plain, but I added lots of romaine, spinach, cilantro, and red cabbage to mine, and a lot of extra chipotle to my husband's. I packed them with organic pear slices and sugar snap peas. For dessert I made Dreena's Chocolate P-Nut Butter Squares; creamy peanut butter sandwiched between an oatmeal cookie-like base and a layer of melty chocolate. Verdict: Hooray, another way to get super-nutritious sweet potatoes into my son! I was worried that the chipotle would be too spicy so I used the smaller amount; it added a nice hint of smokiness without being too hot. Shmoo ate it all with an "mmm! ", even the "crust". I tried to point out how much nicer my pita looked with all those lovely greens and purple cabbage, but he was having none of that. And the bars? Gooey, sweet peanut butter and smooth, rich chocolate -- what's not to love? Thanks, Dreena! 5 stars. Cornish pasties go back hundreds of years; Cornish miners packed these savory pies filled with beef, potatoes, onions, and turnips with them to work as a portable, hand-held meal. Sometimes they were filled with a bit of apple or jam at one end so you could eat through lunch and hit dessert! I wasn't that clever, though. I filled these pasties with diced potato, turnip, and Morningstar Farms Steak Strips. 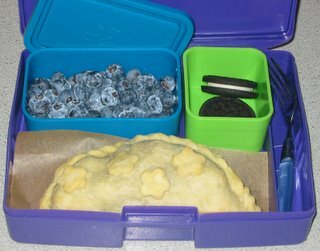 Fresh blueberries and two mint Newman-O's were dessert. Verdict: This was our first taste of these vegan steak strips, and it's been so many years since I ate steak that I found the first bite unsettling -- very steaklike! But the pasties were really good. I thought I was all done creating recipes for my cookbook, but I might need to add this one... Shmoo ate every last bite. 5 stars. P.S. Tomorrow afternoon Shmoo has a dentist appointment. He won't have a lunch box, but he'll have shiny clean teeth! We're having fun with Ricemellow vegan marshmallow fluff from Food Fight! Mostly we've been scooping up the fluff with a one-ounce cookie dough scoop to top mugs of hot soy cocoa -- just like melty marshmallows! For lunch I made Little shmoo a fluffernutter (peanut butter and marshmallow fluff) sandwich on Rudi's Organic Multi-Grain Oat bread (amazing -- organic wheat bread with no trans fats, corn syrup, or honey!). The bread was just wide enough to cut each half of the sandwich into a little kitty cat. The fruits & veggies of the day are organic apple slices, sugar snap peas, and baby carrots. Beverage: vanilla soy milk. Verdict: Little shmoo loved his fluffernutters! 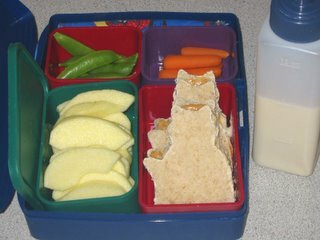 He ate all his apple and sugar snap peas but ran out of time to finish the carrots, which he ate as part of his after-school snack. 4 stars. 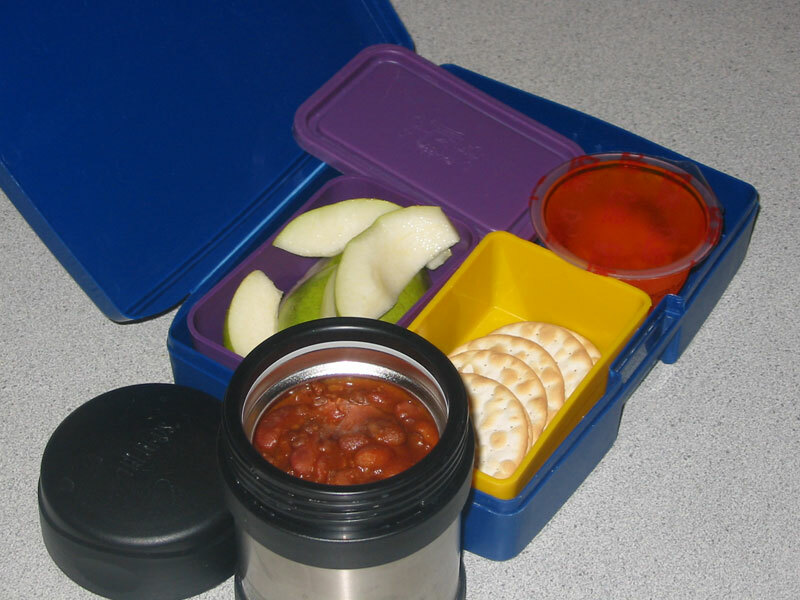 Today is another noon release -- no lunch box! 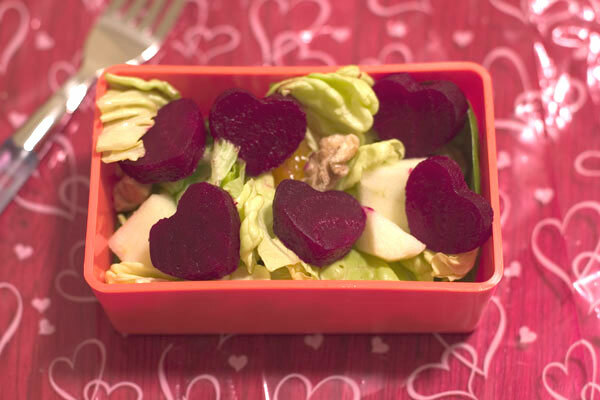 So instead here are some pictures of the Valentine's Vegan Lunch Box I created for the February issue of Satya Magazine, a wonderful New York-based magazine combining animal advocacy and social justice. The lunch features Heart Beet Salad made with roasted beets and oranges, and Tomato Roses on a Bed of Cannellini Bean Purée, served with multigrain crackers or baked pita chips. For dessert there are scrumptious Cherry Almond Scones. 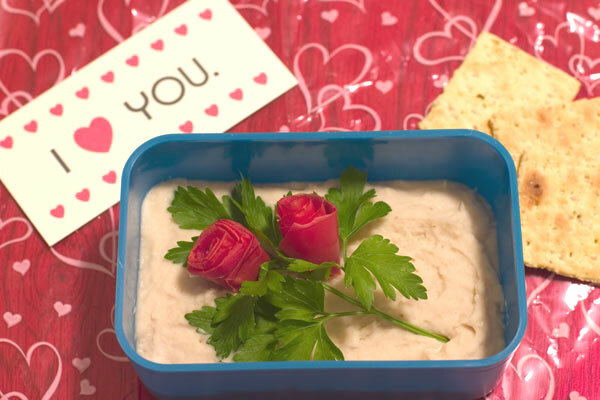 Finally, a Valentine's lunch box wouldn't be complete without a little Valentine's Day card and a bite of sweet dark chocolate! January 29th was Chinese New Year -- welcome to the Year of the Dog! In celebration of the occasion, I purchased a copy of Bryanna Clark Grogan's Authentic Chinese Cuisine . 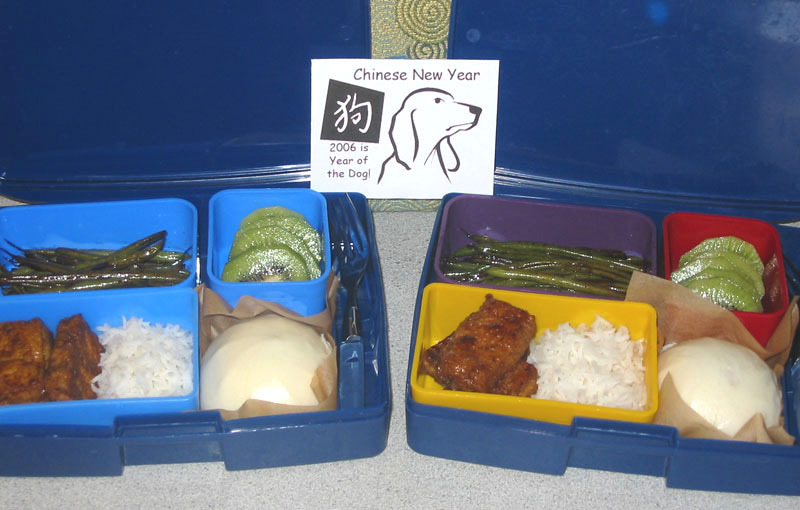 I picked two recipes she said were good cold or at room temperature: tofu Char Sui with rice, and Chili Green Beans (chili flakes left out for shmoo). On the side are steamed dumplings filled with sweet red bean paste, purchased frozen at the Asian market and resteamed at home, and Chinese Gooseberries, aka kiwi fruit! Verdict: Shmoo ate absolutely everything and I only got through half of mine, which made me realize that he's an even better eater than I am! Or at least a faster one... The dumpling was the first big hit with its sweet filling, then the green beans made his eyes light up. "Are these beans teriyaki? No wonder they taste so good!" The deep-fried tofu Char Sui was my favorite. 5 stars. P.S. Since it is the Year of the Dog, perhaps we can all do something to help dogs this year! Maybe this will be the year to open our homes to a shelter dog (ahem, hint to my husband...), or send our support to organizations that encourage us not to eat them, wear them, or experiment on them. Woof! 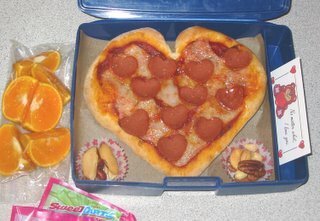 I veganized a stromboli recipe from my friend Renee's booklet The Happy Lunchbox (scroll down to see the booklet). I substituted vegan deli ham slices and vegan mozzarella cheese for the ham and cheese in the original, and instead of pickles I used these adorable baby zucchini I found at the store, lightly seared to remove some of the moisture. The fillings are rolled up cinnamon-roll style in a white/wheat dough and baked. Renee's booklet also suggested packing popcorn for lunch, so here's a bag of popcorn sprinkled with the #1 vegan popcorn topping: nutritional yeast (Little shmoo says "Mmmm, cheesy flakes!"). For dessert there's raspberry fool made from layers of fresh raspberries and silken tofu-lemon custard. Verdict: Even my husband liked the stromboli, and he usually won't touch vegan meat or cheese with a 10 foot pole! Thanks, Renee! The only leftovers were two pieces of baby zucchini and -- you guessed it -- a crust. 4 stars.